FanKick Premier League is a Fantasy League. This is how your experience will be when you take the contest – we know that it is easy for you to start a game, you just need to tap Play Now! Everything is set, take your guard and start playing. We know that you hate instruction manuals, nor we expect you to read them. Read this and understand the game or skip this and play the game! Can I login with my Email ID? Can I login with my Facebook ID? Yes, you can login with your Facebook ID. How do I login into FanKick? You can login with your mobile number or Facebook ID. What you are going to do with my mobile number? Do not panic. We are not going to call you continually or do we have a business plan in place. Is it mandatory to create profile? Yes, we don’t want to limit your permissions. Your profile will give us a better understanding of YOU. Create profile and enjoy FanKick to the fullest! I am unable to perform any actions, what might be the reason? Sorry, you cannot delete your profile. ** Tap on ‘Save’ button, your profile is updated! Can I block other users? 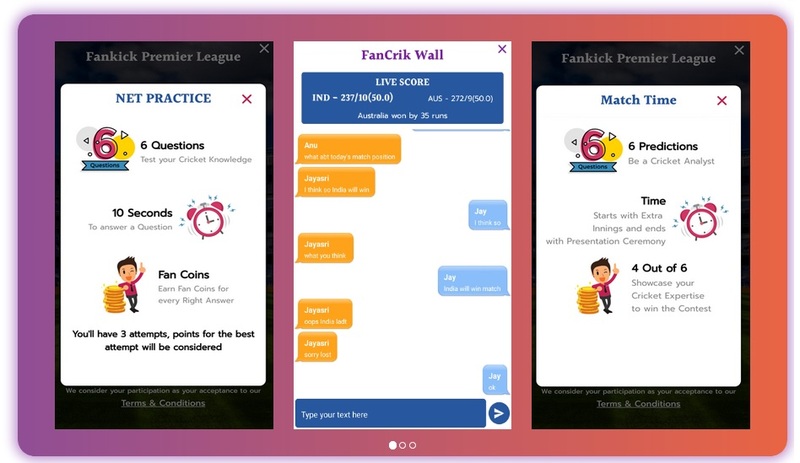 FanKick empower fans to experience all dimensions of entertainment at your finger tip! Fans can connect, communicate & indulge in compelling fan moments which are etched out in an exciting ensemble of app features.